First off heres the side by side view (ok its not a good photo). But you can see the size difference, and the missing half of the center rod, all good for more flow. The stepper motors were swapped over so the ECU would still know where it was(and so i knew it was a working one). Though i think it winds if fully open everytime its starts, then puts it where it wants it. 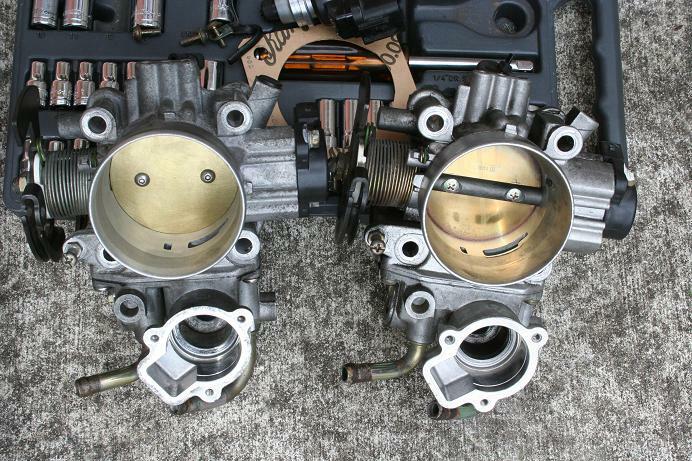 In preperation i removed the hoses to the throttle and looped them together, so no water heats the throttle body. I had also removed the little flap inside which is heat controlled. The problem so far was that with stock cams and ecu is any gap around the butterfly( even .1mm or so) means the idle is too high. The lowest it got was 2200rpm with the flap reinstalled in the closed position. This isn't a problem for JUN cam cars as they will need alot more air andfuel or cars with aftermarket ECU's that can be altered to suit the mods. But i want to have the factory ECU running the car without any extra electronics so Bartis going to fit a tigher butterfly. The car was also very lean with isn't surprising given the huge increase of air that a 63mm gives. I took the car to 6000rpm and even the exhaust gas smelt lean, so i reinstalled the factory 60mm. Though it did sound good. Next i found a post that Dave from RPW had made saying a 63mm required a FPR to work with the stock ECU. Though I had figured that by now, so i got a nice sard FPR from twstd at Driven performance and have today gone to get some fittings to hook it all up on a spare manifold. 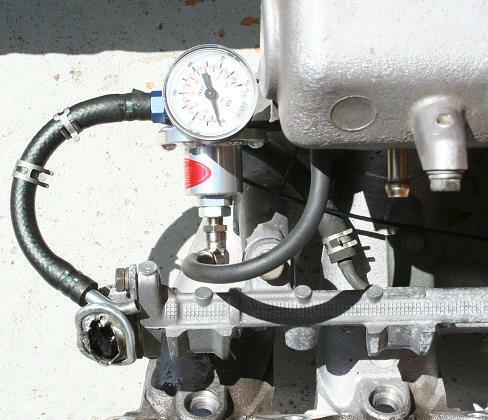 Here the layout of the fpr on the manifold with the gauge installed and the side fittings done. Theres even a nice bolt hole for it and all. Though i'll drill a second one to hold it on the actual manifold in the car. My 1 is aat 3.5 bar.